CHIP was founded in 1979. It all started when Alvin Goldman and several other clients from the Audiology department of the Queen Elizabeth Hospital received a letter from their audiologist, Dale Bonnycastle, inviting them to discuss the possibility of forming a self-help group for hard-of-hearing persons. Dale Bonnycastle, an audiologist at the Queen Elizabeth Hospital, felt that the services offered to hearing impaired people were lacking, that administering hearing tests alone was clearly not enough, and the psychosocial aspects of hearing loss were not properly addressed. With assistance and input from Joan Westland, the executive director of the Association of Hearing Impaired Adults, and Marilyn French St. George, audiologist and teacher at the McGill University School of Human Communication Disorders, a plan was put together to form a group for adults with acquired hearing loss that would focus on self help, sharing difficulties and finding constructive solutions. It was with these issues in mind that 14 people gathered for a first meeting in mid-October 1979, ready to devote their time and energy to the English-speaking hard-of-hearing community. Dale Bonnycastle, Alvin Goldman, Ed Plover and Lily Bernstein were the first active members who formed CHIP’s team. They quickly devised numerous ideas and plans, including programs and workshops, as well as the much-appreciated biannual magazine, The Communicaider. The first program, named “Aural Rehabilitation,” later developed into the HEAR program. It included workshops on topics such as the anatomy of the ear, communication strategies, phonetics and acoustics (later known as the very popular Speechreading workshop), emotional issues related to hearing loss, hearing aids and devices (later known as the ALD program), and coping with stress. These topics and concerns still remain vital to CHIP today. CHIP’s first home was at the Queen Elizabeth hospital. 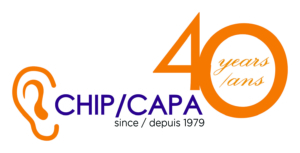 In 1982, as the Audiology Department was closing down, CHIP’s office moved to Decarie Blvd, at the Mackay Center. CHIP then moved to the MAB-Mackay Rehabilitation Centre on Sherbrooke St West, where it has remained.